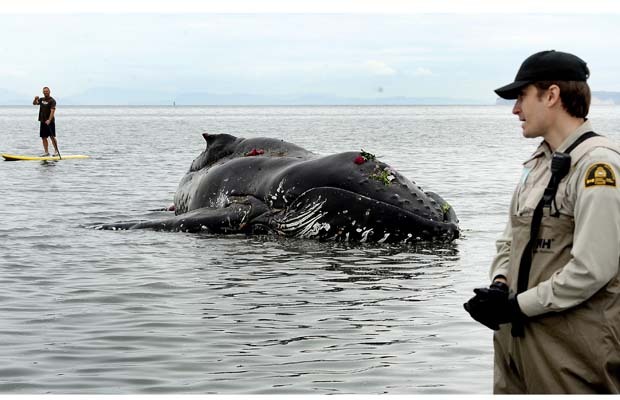 Humpback whale’s carcass found along BC shoreline. The Department of Fisheries and Oceans is investigating whether there’s any link between four humpback whales found dead off B.C.’s central coast over the last week. Marine mammal coordinator Paul Cottrell said necropsies were performed on two of the whales, but it could take weeks to determine the causes of death. 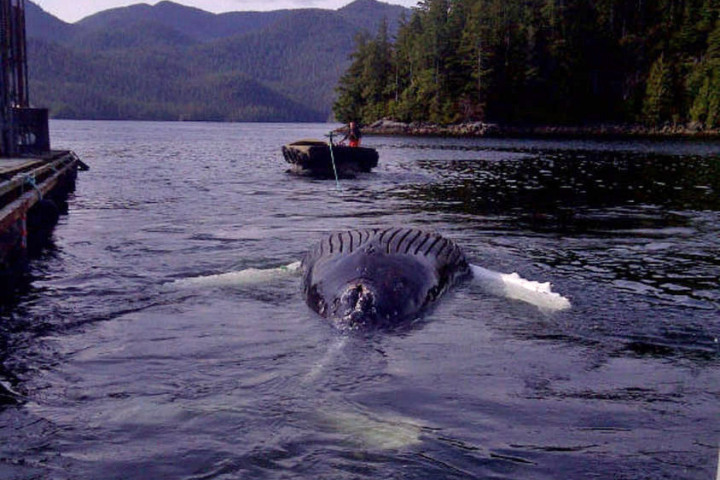 One of the whales, a young female, was reported a few days ago near the community of Klemtu, north of Bella Bella. Someone from the local First Nation secured the whale to the shore, allowing Cottrell and a provincial veterinarian to perform a necropsy on Saturday. Philip Charles, a guide with Spirit Bear Adventures, shared breathtaking photos of the animal online along with an emotional farewell. Humpback whale’s carcass towed off White Rock beach, BC, Canada. Charles, who has a background in conservation and biology, told CTV News he’s concerned entanglements with commercial fishing gear may have played a role in the whale’s death. White Rock beach, BC, Canada. A humpback whale has washed ashore. Cottrell confirmed that scars found on the animal’s tail indicate it was entangled at some point, but it’s not clear yet whether that played a part in its death. The apparent entanglement scars were already necrotized, according to the DFO, but there was also a fresher cut on the whale’s tail that was still open. 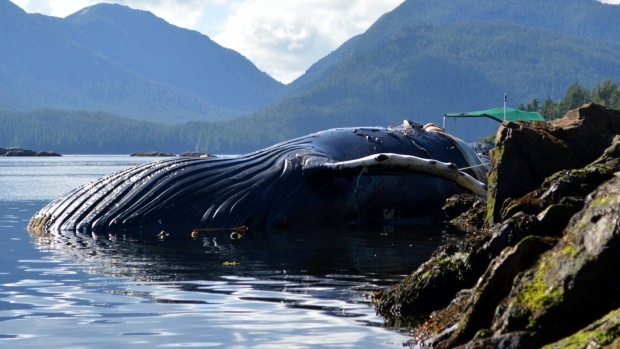 Another necropsy was performed Tuesday on a whale found in Haida Gwaii. The animal didn’t show signs of entanglement but had some of its baleen, a filter-feeding system in its mouth, removed. Cottrell thanked First Nations members for reporting all the discoveries quickly – a key to obtaining information that could help determine a common cause – and urged the public to do the same for potential future finds. “It’s really important because the fresher the animals the more likely we’ll get better tissue samples,” he said. Anyone who spots a dead whale is asked to call the DFO’s Observe, Record, Report line at 1-800-465-4336. CTV Vancouver News: Four dead humpback whales found off B.C. coast in one week.